When I was growing up, a dusty bottle of Greek Retsina held court in our pantry cupboard. My mom purchased it while traveling in Greece back in the 50s, hoping one day to open it with fanfare. To my knowledge, it’s still there, crusty and dusty. Sometime after I’d gone deep into wine, she did ask me if it would still be tasty if she opened it at that point. My response was guttural, mostly because my experience with Retsina resembled grain alcohol laced with turpentine – on a good day. It wasn’t until several years later, when I stumbled into the incredible Mediterranean restaurant Zaytinya in Washington DC, that I realized Greece might have other delicacies to offer than this famed, nose hair-burning liquid. The former stomping ground of the gods still continues its Retsina tradition and a few wine writer friends have identified some good ones. I haven’t had that pleasure yet. But Zaytinya, where no domestic wine appears on the list, threw me into the deep end of the other Greek wine pool. I remember reciting the “traditional” varietals I enjoyed and the sommelier translating those into Greek varietals. It was a wine geek’s Greek dream come true. The translation also taught me how to pronounce the Greek varietals (and wineries, for that matter). Most aren’t spelled in a way that my American tongue can wrap itself around. Consider Agiorgitiko, a red grape varietal indigenous to Greece. I really want to belt out those Gs but, alas, ‘tis not correct. The correct pronunciation is Ah yohr YEE tee koh. Forget the G and add in the Y, and you’re golden. Sommeliers everywhere will be impressed. It might do you some good to learn some of these grape names, since Greece is making inroads on American shelves and wine lists. A cradle of viticulture, Greece boasts over 300 indigenous varieties (some say even more), though few, maybe 8-10 of them, make it into the states. I recently tried a dozen or so of their wines and, as I was back in DC, was pretty blown away. 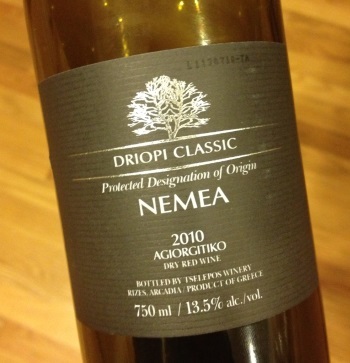 Their red varietals, especially those from the growing regions of Nemea and Naoussa, are defined by an earthy rustiness similar to South Africa. Look for Agiorgitiko and Xinomavro [ZEE no MAV row]. Two whites that will tempt you with flowers and stone fruits: Moschofilero (MOHS koh FEE leh roh) and Malagousia [MA lah GOO zee AH]. And one other – which is really my favorite – is Assyrtiko (ah SEER tee CO), a celebrated white grape gushing citrus, minerals and elegance. Less successful wines I tried were crafted from traditional French varietals like Syrah, Cabernet Sauvignon and Merlot. Not one of the “traditional” wines hit the mark for me so stick with Greek varietals. Check out the digs at Domaine Biblia Chora. Um… yeah. Quality is seriously high and so is value in the Greek sector. Seek out wines from wineries like Domaine Gerovassiliou, Biblia Chora, and Boutari. Domaine Gerovassiliou, a champion of many things wine in Greece, saved the beautifully fragrant Malagousia grape from near-extinction. Not new to the game, this winery has been named Winery of the Year by Wine & Spirits Magazine four times. Biblia Chora Areti, a super modern winery that looks like it belongs in Napa Valley, was founded by a prodigy of Vangelis Gerovassiliou, Vassilis Tsaktsarlis in 2001. You might think Greece has only just begun their journey into high-quality wine, and you’d be right. But riding along with this burgeoning wine country is the right decision, like getting in on the ground floor of a Silicon Valley startup. And more importantly, it’s a long way from Retsina.